Cuban cuisine typically combines seafood or meat, African inspired flavors and spices, and influences from the Spanish. Throughout my time in Cuba, I was in awe of the colorful meals I ate outside of Havana. My favorite lunch was in Playa Larga, Cuba when my partner and I decided to escape the city and stay in a small beach village. 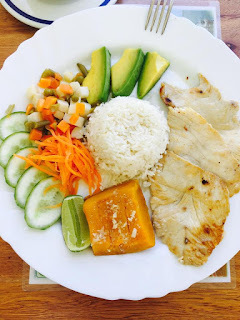 As we walked up and down the beach, my partner and I came across a local cafe that served fish (pescado) accompanied by local seasonal vegetables, rice, and avocado. I enjoyed the simplicity of this dish as the Cuban people were utilizing local resources in Playa Larga. The fish was fresh, the vegetables were locally grown, and the rice was perfectly cooked. I had some of the best seafood that I've ever had in my life in Cuba. The abundance of fresh fish, shrimp, squid, and lobster are often main menu items for travelers. Whether you're getting a quick bite on the beach or dining at restaurant Vista Mar in Havana, you will not be disappointed by Cuba's seafood. Soltura Cuba Travel offers unique trips to Cuba that are curated to your interests. We are offering exciting trips this spring and fall!